A Comprehensive step by step tutorial on creating offline Android/iOS Mobile App using React Native and SQLite. Sometimes we need to build or create Mobile Apps that work without an internet connection or offline. In this tutorial, we will play with data without accessing an API or Web Services. For that, we choose SQLite as a local Database. Before start to the main steps, make sure that you have installed Node.js and can run `npm` in the terminal or command line. To check the existing or installed Node.js environment open the terminal/command line then type this command. 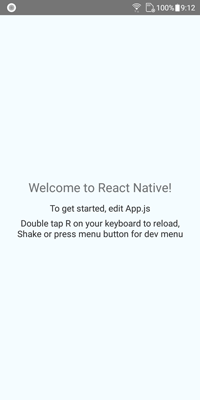 The Create React Native App is a tool for creating a React Native App. To install it, type this command in your App projects folder. Then create a React Native App using this command. That command will create a React Native app then install all required modules. The app or project folder will contain these folders and files. 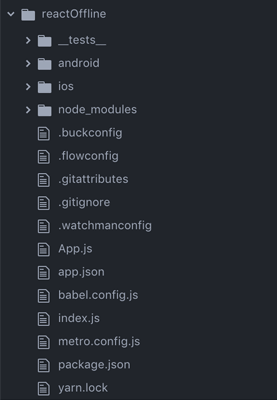 Next, go to the newly created React App folder. To run on iOS device or simulator run this command. The simulator will open along with the new terminal window. Go to the project folder from the new terminal window then run this command. Right after iOS build success and React Native started, you will see this view in the iOS Simulator. To run on Android device or simulator, make sure ADB detected the device. Next, type this command to run on the Android device or simulator. It will open the new terminal windows. Just go to the project folder then type this command. You will see this app in your Android device. Make sure you're running a packager server or have included a .jsbundle file in your application bundle. Don't worry, just start the Metro Bundler in the newly opened terminal window after you go to the project folder. After Metro Bundler started completely, refresh the React Native app on your device or simulator. In iOS Simulator you will see this error after refresh. Attempting to reload bridge before it's valid: <RCTCxxBridge: 0x7ff34bc00510>. Try restarting the development server if connected. Just reload again the React Native app, you will get your React Native app running. 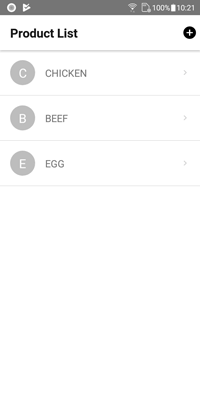 Above generated React Native App just show blank app with plain text. Now, we will show you how to add the Navigation Header and Home Screen for your app. So, it will look like the Native App. In the terminal or command line, type this command to install React Navigation module and don't forget to stop the running Metro Bundler before installing the modules. Next, create a folder for components and components files in the root of the app folder. Open and edit `components/ProductScreen.js` then add this React codes. Open and edit `components/ProductDetailsScreen.js` then add this React codes. Open and edit `components/ProductAddScreen.js` then add this React codes. title="Go to Add Product... again"
Open and edit `components/ProductEditScreen.js` then add this React codes. title="Go to Edit Product... again"
Next, open and edit `App.js` then add replace all codes with this. After Re-run the React Native app on the iOS/Android Device/Simulator you will see this updated views. Before creating an offline CRUD application using local data, we have to install the `react-native-sqlite-storage` and required UI/UX module. Open and edit `Database.js` then add this SQLite import with the configuration. Add constant variable after that. 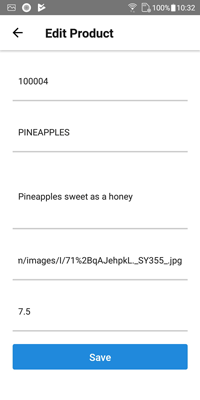 Give this file a class name. Inside the class bracket, add a function for Database initialization that creates Database, tables, etc. Add a function for close Database connection. Add a function to get the list of products. 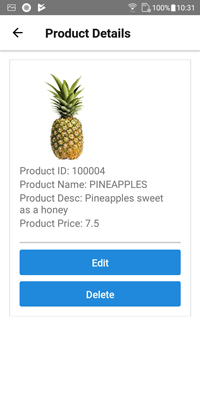 Add a function to get Product by ID. Add a function to save a new product to the SQLite database. Add a function to update a product. Add a function to delete a product. To show or display the list of product, open and edit `components/ProductScreen.js` then replace all imports with these imports. Instantiate the Database as a constant variable before the class name. Next, replace `navigationOptions` with these. Add a function to initialize the screen. Add a function to get the product list from Database class. Add a variable to iterate the listed product in the view. Add a function to render the List Item. Add a function to render the rest of List view. Finally, add a stylesheet for the whole screen after the class bracket. From the list of product view, you will see that list item has an action button to show the product details. Next, open and edit `components/ProductDetailsScreen.js` then replace the imports with these imports. Instantiate the Database as a constant variable. Add a function as the constructor. Add a function to delete a product data. Add a function to render the whole Product Details view. Finally, add the stylesheet for this screen after the class bracket. To add or save a new Product, open and edit the `components/ProductAddScreen.js` then replace all imports with these imports. Add a constructor inside the class bracket after the `navigationOptions`. Add a function to update the input text values. Add a function to save a product to the SQLite table. Add a function to render the whole add product view. Finally, add the style for the whole screen. To edit a product, open and edit `components/ProductEditScreen.js` then replace all imports with these imports. Add the constructor after the `navigationOptions` function. Add a function to initialize the screen that will get product data. Add a function to update the input text value. Add a function to update the product data. Add a function to render the whole Edit Product screen. Finally, add the stylesheet after the class bracket. As we show you at the first step, run the React Native and SQLite app using this command. After the new terminal window open, just go to the project folder then run this command. Now, you will see the whole application in the Android/iOS Device. That it's, the React Native and SQLite Offline Mobile App. You can get the full source code from our GitHub.